When watching the NBA Playoffs almost every fan will have some kind of gripe against the refs at one point or another. There’s always a game or two where you feel your team got the short end of the stick when it came to the whistles. Some will say that’s part of home court advantage, some say the more aggressive team is given the benefit of the doubt, and some will claim the league is flat out rigged. However the game ends up being called, the primary thing both players and fans will ask for is consistency and it’s the particular lack of consistency that has made the refereeing of this years playoffs so controversial. While there have been scattered inconsistencies throughout this year’s playoffs, game 5 of the Miami-Indiana series serves as a focal point for inconsistent calls and feeds the conspiracy theorists who believe in superstar calls and league-favored teams. The controversy in the game is over the definition of a personal foul, a flagrant 1, and a flagrant 2. Lets look at a flagrant 1 that is given to Tyler Hansbrough for his foul on Dwayne Wade. In the play Hansbrough definitely swings down on the ball with a lot of force, making contact with Wade’s head. Hansbrough was undoubtedly making a play on the ball, but if you want to say he used unnecessary force, thus making it a flagrant 1, that is fine, but that also creates a standard. 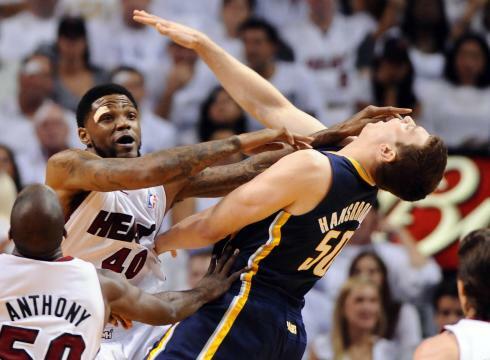 Now lets look at the flagrant that was given to Udonis Haslem for his foul on Tyler Hansbrough. This play was ruled a flagrant 1 despite the fact that Haslem clearly makes NO attempt to make a play on the ball and instead forcefully throws both arms at Hansbrough’s face, undoubtedly in retaliation for Hansbrough’s foul on Wade earlier in the game. If Hansbrough’s foul was ruled a flagrant 1, there is no doubt this should be ruled a flagrant 2 (as announcer Steve Kerr immediately notes) due to the fact that the foul is an unnecessary and forceful blow to the face, with no attempt to go for the ball, and is likely a retaliation play. Despite this, the foul is ruled a flagrant 1 and Halsem, a key player for Miami due to Bosh’s injury, is allowed to play the remainder of the game. Sure, Haslem has been suspended for the upcoming game 6, but the fact remains that he was allowed to play in a critical game 5 for Miami and will also be available for a game 7 if the series goes that far. Was Hansbrough punished by the refs for the fact that he got up after that foul, rather than lying on the ground as if he was shot like Wade did earlier in the game? Let’s also consider that in instances like this, referees are instructed to call flagrant 2 fouls, as those are then reviewable, where as flagrant 1 fouls are not. So by this judgment, the referees are saying that this is clearly not a flagrant 2 foul. Put me down as suspect. Lets then look at the foul by Dexter Pittman on Lance Stephenson that was also dubbed a flagrant 1. Not even the biggest Miami homer can argue that foul should not be an immediate ejection. Not to mention Pittman’s wink over to the Miami bench, making Pittman’s clear act of revenge that more disgusting. And once again this was called a flagrant 1. To go even further in the case of referee inconsistency in the series came when Dwayne was called for a flagrant for his foul on Darren Collison. While I don’t disagree that this should be a flagrant 1 foul, it is hard to argue that Wade made much of any play on the ball and simply lowered his shoulder into the back of a defenseless Collison. Let’s just say that wouldn’t fly on the playground. The inconsistency comes in the fact that earlier in the year Jason Smith committed a near identical foul on Blake Griffin and was suspended 2 games for it. That sets the precedent. What was Wade’s consequence? No suspension. No fine. Some may argue that it’s the nature of playoff basketball and that playoff suspensions should be for only really harmful plays. To that school of thought I offer you James Posey’s foul on Kirk Heinrich that landed him a 1 game suspension…and that was in a playoff game. Can I sense some major favoritism given to the stars of the game? If Louis Amundson had committed the same foul against Wade (and inevitably see Wade lay on the floor for an hour, whilst having LeBron negotiating with the refs) would we be looking at a suspension? No doubt about it. Wade’s ‘attacker’ would have been immediately removed from the game, would probably face a suspension (like Smith and Posey), and he would probably be talked about like some kind of arch villain on Sportscenter. Similarly, if Jason Smith committed on Reggie Evans rather than NBA golden boy Blake Griffin, there is no way a 2 game suspension would have been handed out. Unfortunately that is the NBA David Stern has created and allowed today. It almost seems as if the league and media are yearning for the superstar driven league we saw in the 80s and 90s. That desire is putting a serious damper on the game. People complain about the diva attitude that many NBA stars display? Blame the entitlement that league has given these players based on their superstar treatment. If the NBA wants to get rid of the growing conspiracy theories, its inconsistencies like these that need to be amended. Will Indiana retaliate? Lets just say game 6 will be a fun one to watch. 1. The Knicks just aren’t that good. Despite all the hype about Melo, Linsanity, STAT, and Defensive Player of the Year Tyson Chandler and despite being a headline love child for the major media outlets, we can finally see that the Knicks simply aren’t a great team and deserved that 8th seed. I know they had some injuries, I know that the Heat are a great team, and I know fire extinguishers are a very formidable opponent…but its hard to deny that this Knicks team was pretty over hyped. 2. The Pacers are the anti-Knicks. How can a team that finished with the 3rd seed be so under the radar? Despite the lack of a true superstar, this Pacers team is loaded with very good players. Danny Granger, David West, Roy Hibbert, George Hill, Paul George, Darren Collison with names such as Leandro Barbosa and Tyler Hansbrough off the bench. They may not all be household names, but that is a VERY good team with a lot of talent and depth. Don’t be shocked if they give the Heat a serious run for their money. 3. The Spurs and the Thunder are for REAL. Both of these teams are an absolute joy to watch. In terms of the Spurs, Duncan has found the fountain of youth, Parker is playing some of the best basketball in the league, they have an incredibly deep roster, and play possibly the best team basketball of any team out there. You want to know how basketball is supposed to be played? Watch the Spurs. The Thunder, on the other hand, are just so difficult to contain. Durant, Westbrook, and Harden are nearly impossible to stop…if you corral one, another will go off. We saw this against the Mavs. Games 1-3 were all very close, but Durant, Westbrook, and Harden each took over one of those games and got the Thunder a win. It’s hard to do much about that. 4. Andre Miller is incredible. There’s a lot of buzz about Javale McGee following the Nuggetts win in game 5 and deservedly so…he played great, but this overlooks the absolute CLINIC put on by Andre Miller in that game. Post moves, floater, bank shot, lob pass, spin move, you name it and Miller put it on display AND made it look easy. The fact that Miller has no speed, can barely jump, and is older than every single player on the Lakers roster, yet is still able to dominate a game…that is incredible. I’m not sure about George Karl’s claim about Miller being a top 10 point guard of all time, but this guy might have a serious claim to top 10 most underrated of all time. 5. Javale McGee has made himself some serious cash. You think McGee doesn’t know he’s a restricted free agent this summer? Something tells me he’s going to be getting a lot more than that $3.5M qualifying offer after his performance in the Lakers series. 6. Was Josh Smith serious with that inbounds pass? I know the Hawks got away with it because Rondo fumbled the ball at the end and it will probably be overlooked and forgotten, but come on. You are going to throw a bounce pass right at one of the league’s great steal artists…and expect to get away with it? Imagine if Rondo didn’t fumble the ball afterwards and ended up scoring…that play ends the Hawks’ season. I guess that’s why they are the Hawks. Yes, we all know the RG3 deed has been done. He is officially with the Redskins, and it’s about time, because we all know they desperately need a franchise quarterback. However, there is a name floating around the football world that many are saying will cause some surprises in Washington. I’m talking about Kirk Cousins, the quarterback from Michigan State, who was drafted by the Redskins in the 4th round. The Redskins picked Griffin with the no. 2 overall pick to be their franchise QB, and already re-signed veteran QB Rex Grossman as his back-up. So the move to draft Cousins came as a surprise to many, including himself. Cousins said, “I’ll be the first one to say it was a surprising pick to me, as well. My job is to help the Redskins win football games, however that may be, and I’m going to keep an open mind”. Was this pick a huge mistake for the Redskins? Or will it provide some insurance for the team in the years to come? First off, I think RG3 fanatics can still sleep easy; I don’t see this pick as a bad move, and if RG3 really had an issue with the drafting of Cousins, we’d be hearing about it. Cousins and Griffin will be competing with one another to win games for the Redskins. More importantly, this is insurance for the Redskins at a position they’ve had instability with for some time. Cousins has simply come on board to work on his development as a quarterback for years to come. Just think back to last year, when some of the most able-bodied QB’s went down with injuries. When Peyton Manning went down, Curtis Painter stepped up (hardly), as did Dan Orlovsky, and finally Kerry Collins. Similar situations also arose when Jay Cutler and Matt Schaub went down. Teams just need to be prepared, and this was really all I concluded from the drafting of Cousins. What I find most interesting about the draft, is that you can never really tell how successful players will be. In the case of quarterbacks, Boise State QB Kellen Moore (with 50 TD’s) went undrafted. Remember Jamarcus Russell going #1 overall, and Ryan Leaf going #2 overall? Both players ended up being complete busts! Even Mr. Joe Montana was the fourth QB picked at the end of the 3rd round; 82nd overall, and look how far he’s come in his career. When it comes to quarterbacks in the NFL, you can never have too many options, but make no mistake… right now, it’s all about RG3 in our nation’s capital! Junior Seau’s style of play transcended and revolutionized the linebacker position to what it is today. His illustrious 20 year career has left an unforgettable mark in NFL history, as well as San Diego. Before the NFL was what it is today, there was no player that could match the intensity, enthusiasm and larger than life presence that Junior brought. On the field Junior terrorized opposing offenses. A highly decorated sack machine in San Diego, Seau made multiple Pro-Bowls and helped the Chargers reach its very first Super Bowl appearance in 1994. His sack celebration is one of the most memorable celebrations in NFL history, and one that quarterbacks still have nightmares about. Although many players will often imitate his intensity, no one will ever duplicate the irrepressible spirit of Junior Seau. He was, and for some still is, the face of the San Diego Chargers. But better yet, he epitomized San Diego. Although he had a larger than life persona on the football field, off the field he humanized himself to the community. Seau dedicated his time to help the youth tackle the trials and tribulations of life, as well as mentor aspiring athletes by guiding them away from trouble. He always opened himself up, and was more interested in how others were doing. Junior was selfless and that’s what was so intriguing and likeable about him. Junior Seau will be forever remembered as a man that gave everything to his team, his city, and for his family. On May 2nd, 2012, San Diego lost a son, leader, and legend. Selfishly we miss and want Junior back. Although now he is at peace, his smile will continue to shine bright over San Diego. Thanks for the memories, Junior.